The lights work, the appliances work, the box is organized, the place just feels better!!! Thanks for taking charge of the electrical situation in our whole house, not just the basement. Jane and I feel so much better after the improvements you made. We ae honored that you would go the extra mile for us and appreciate the care, concern, professionalism and positive attitude you brought to the job. … we miss you and wish you and your family God’s blessings. “Please tell Andy his idea for the air switch was brilliant and it works perfectly! Beautiful installation. 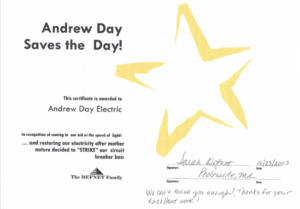 Thanks!” S.C.
“Andy – this is a long overdue thank you from us and our house! It’s hard to believe that we have known you and that you’ve done work for us for over 21 years! We had just moved into our totally rebuilt home in 1990 only to discover that our original electrical contractor hadn’t done many things we would have liked. You were referred to us; you arrived at our home and worked your electrical magic… and in no time you had EVERYTHING working the way it was intended to. Over the years you added technology; fixed things; found ways to fixed things when parts were no longer available… we came to realize that there was no task or problem you could not solve, including installing a seamless generator system providing instant relief for us from Pepco’s endless failures! Knowing your reliability and trustworthiness, we’ve always left you a key to the house, our alarm code and knew we’d arrive from work, travel, wherever… to find a job done perfectly and the location of the work spotless; and your pricing is always beyond fair and reasonable. 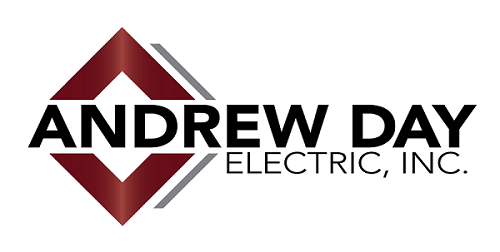 Over the years it’s been our pleasure to recommend you to anyone who asked ‘do you know a great electrician’. It has also been a great pleasure to work with your wife Timbre in setting up all our appointments. We have developed a wonderful phone friendship. She is a joy to talk to and her organizational skills at getting things set up and following through are the greatest. As you know, last month we sold our wonderful home in Bethesda to spend a lot more time in our Rehoboth home. We wish we could take you with us because we’re not sure how we’ll live without you! !